So, you’ve read all about the foundation and pillars of a successful total productive maintenance (TPM) program. Now what? 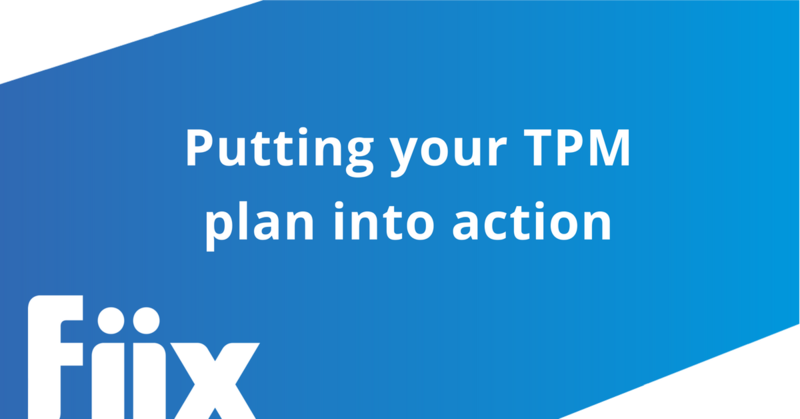 Getting a TPM program up and running can start with the best intentions, but if a proper implementation plan isn’t put in place, it could very likely fall apart. The fact is, not every aspect of total productive maintenance can be put in motion at once. According to ToughNickel.com, you’ll be far more successful taking it one step at a time. We’ve summarized the steps to implementing a total productive maintenance plan and the benefits of TPM below. While you may be tempted to introduce TPM activities across an entire facility at once, getting started with one pilot area, or even one machine, will allow you to pay close attention to what works, what doesn’t, and what may need to be adjusted for the future. It also allows early adopters of the program to become champions who will help support the rollout of the program later on. When selecting pilot equipment, you may choose to start with a simple machine that is not critical to production, or conversely, with machinery that causes a bottleneck or is highly critical. There are costs and benefits to each approach. Starting with a simple machine is low-risk, but makes it harder to measure the effectiveness of the improvements made. Choosing a highly critical piece of equipment can have a big effect, but can be risky if the TPM process is not carried out correctly. You’ll know which approach is best for your team. In terms of who to include in your pilot TPM efforts, it’s best to involve as many employees as possible. This will help to build momentum, and, as the benefits of a TPM program are realized, ensure that efforts do not fall by the wayside. Once your pilot area has been defined, it’s time to get moving on your TPM efforts with a combination of 5S and autonomous maintenance. The idea here is that all TPM participants should continuously be restoring equipment back to its basic condition using the activities outlined in the 5S foundation. Once this has been established as the status quo, operators and maintenance staff should begin their autonomous maintenance program, which involves cleaning equipment while inspecting it for deterioration or abnormalities, identifying and eliminating factors that contribute to deterioration, and establishing standards to clean, inspect, and lubricate an asset properly. OEE, or overall equipment effectiveness, measures how available your equipment is, how it performs, and what kind of quality it produces. Measuring this regularly will give you a great indicator of whether or not your TPM program is performing as planned. This will provide you with data-backed confirmation on whether your efforts to eliminate downtime are working, and then track the effectiveness of your efforts over time. This step is carried out using the “focused improvement” pillar of TPM. Once OEE has been established, it’s important to assemble a cross-functional team that can look at the OEE data that has been produced and identify main reasons for losses that have occurred. After a root cause analysis has been conducted, measures can be taken to eliminate these losses where possible. Continued use of OEE measurement will verify whether the focused improvement efforts are working as planned. The final stage of implementing a TPM program is planning and scheduling maintenance activities. Since the goal of total productive maintenance is to eventually eliminate unplanned breakdowns, planned maintenance with a CMMS solution should entail the preventive maintenance that will allow your machinery to run as planned after all TPM activities have been carried out successfully. Of course, there are other pillars to a successful TPM program, such as training and education and new equipment management. These pillars should be continually carried out as you gather learnings from your implementation efforts. You can read more about each of the pillars of TPM here.